Now Mr. Shannon has all the qualities of the Regency Rake – but he has no place in this closed Society, as he is the “natural son” of the Scottish Lord Cartan, and this, coupled with his arrogant air and lack of proper manners and a bad reputation fueled by the gossip-mongers, sets the entire cast of characters off to a rousingly bad start when Shannon returns to The Place unannounced, asserts his rights as owner and expects the Quinlevans to vacate immediately. Georgina labels him a “rag-mannered basket-scrambler” [p.36] and the sparks begin, that ever-present in a Regency Romance “crossing of swords”. Shannon IS an arrogant, cold-hearted Hero. They both are hot-tempered, she “devilishly obstinate” and persistent, with a sharp and honest tongue, displaying all manner of improper behaviors for a Lady; he showing no emotion, no feelings, but seemingly a hardened rake who had married Nuala for her fortune. But Georgina begins to see that in his fine management of the estate, the respect the servants and tenants show him, his growing friendship with Brandon, his protectiveness of her [like all Regency Heroes, he does have a penchant for showing up exactly when the Heroine has landed in the suds! ], that perhaps the neighborhood’s opinion is not so justified after all – her efforts to defend him bring on the tattle-boxes and the damage is done. True to this genre, the conventional escapades begin, Georgina in numerous scrapes, masquerades, marriage proposals in abundance – some for love, some for her fortune – balls, midnight runaways, the machinations of a few nasty and jealous Matrons, and like Heyer before her, Miss Darcy’s strong, silent, Hero does indeed have feelings – all conveyed in his Eyes: “the glad incredulous welcome in his eyes” changing to “an indifferent sardonic coolness”, “the contempt she read in those eyes”, “a look of such bleak unhappiness in those grey eyes”, “those hard grey eyes, strangely softening”, etc…, otherwise we would be at a loss…! 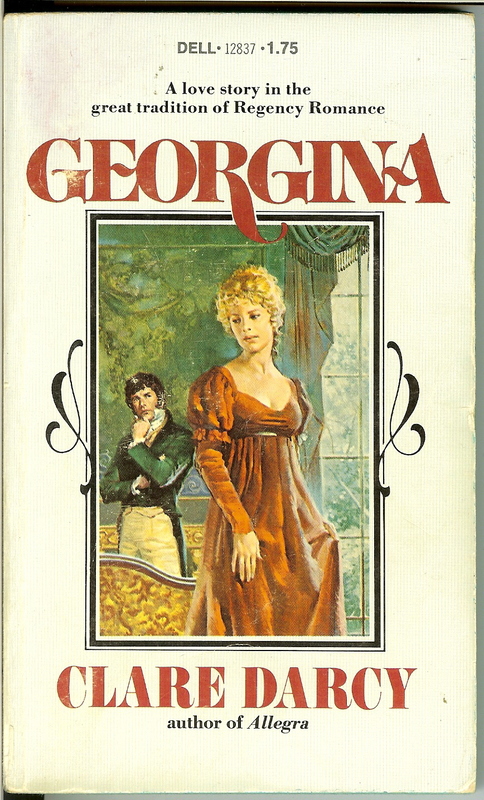 Georgina was Clare Darcy’s first book, though I did not read it first, and I recollect that I thought it more serious than anything Heyer had certainly ever written – truth be told, it lacks that expected humor and even Darcy’s own hand at it improves in her later works. I wonder perhaps that she was not sure where her Regency era talents would take her in this first book. There is a certain gravity to the narrative -we have a dark Hero, a mystery in his past about his marriage and the death of his wife, rejected by a Society that seems more mean-spirited than funny, and a Heroine who fights the fortune-focused, behavior-constraining society she lives in, breaking almost every Rule in the Book to clarify what she instinctively knows about this man. Thankfully, her young cohort Brandon, whose mother is set to have him betrothed to Georgina, is the salvation here – the bookish, Byron-like figure [with the required limp] is quite adorable and amusing, bringing much-needed levity. I liked this book very much – and while we again know from the first moment that the name of Mr. Shannon is introduced on the page, where it is all headed, it was great fun. And one must like a book where the proposing Hero says: “Nay, I’m no hand at speeches!” – even Jane Austen’s Mr. Knightley would approve!